Every adoptive family knows it is coming. It is virtually inevitable. 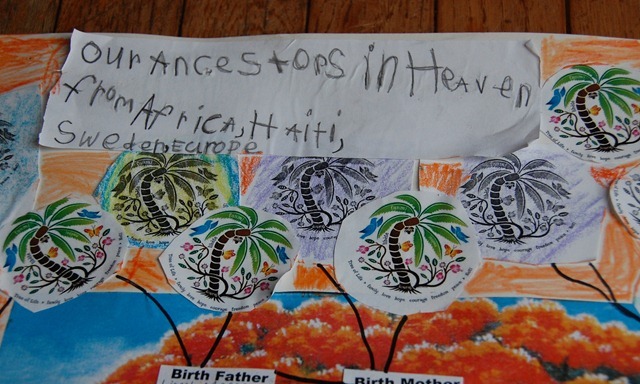 One day your child will come home with that classic school project assignment: The Family Tree. It isn’t news in the adoptive family community that this assignment can be deeply anxiety producing… for the parents, for the kids, for the entire family (not to mention the teacher). So, how to approach it? Far before the assignment ever came home to our house, I had thought long and hard about it (and had my own anxiety attacks about it). I remember reading an article in Adoptive Families magazine, when Kyle and Owen were babies and just home from Haiti, about how to talk with your child’s teacher about handling this assignment in the classroom. Ever since then I had pondered it from time to time, imagining how I’d approach it with my kids, their teacher, and their school. And then it happened—a few weeks ago—the assignment came home. We were told (and I do mean “we”—the assignment was, literally, for the whole family) to do it however we wanted (including as many or as few generations as we choose), with only one caveat: we were supposed to focus in on one individual “on the tree” and give some sort of “vignette” about him or her. Like I said, I had already put a lot of thought into how to approach this when the day came. Still, I was up practically all night the night the assignment came home. 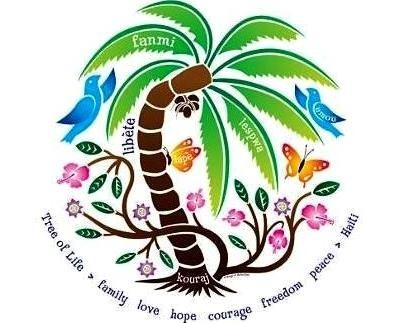 How do you honor your child’s roots, history, culture, and family of origin, while also honoring the extended adoptive family? We had one week to complete it. I lost quit a bit of sleep early in that week, brainstorming how to go about it. We chose to focus in on incorporating two very special pieces of artwork that hang prominently on the walls of our house. 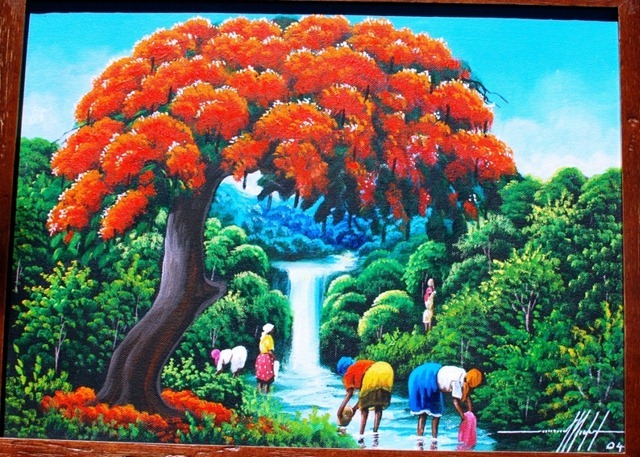 Both pieces depict trees, and are both Haitian in their essence. The first (below top) is a painting that we bought in Port au Prince while we were in Haiti to bring Kyle and Owen home. The second (below bottom) is a print that we bought a few years ago. I photographed both, and then we used these images as the central focal points for the project. 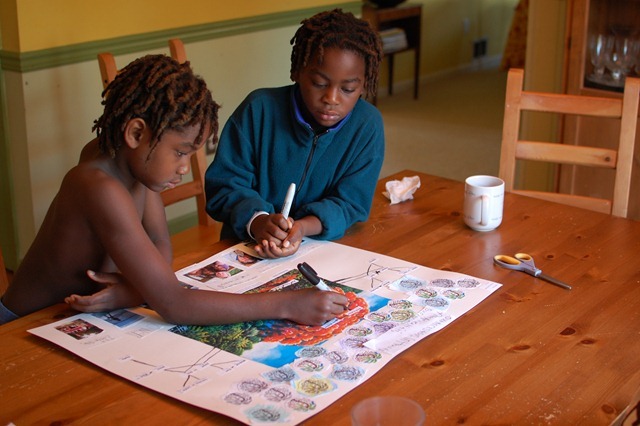 We devoted the full top third of the actual physical project space to “our ancestors.” Kyle and Owen have long been very focused on their “ancestors,” take great pride in their African and Haitian ancestral roots, and are very inquisitive about ancestry in general. So, this was appropriate for them. The middle third of the space was devoted to the actual “family tree” (including the birthparents, symbolically and literally, in the center). We chose to highlight MorMor as the individual about whom we’d write a “vignette” (according to the original assignment). 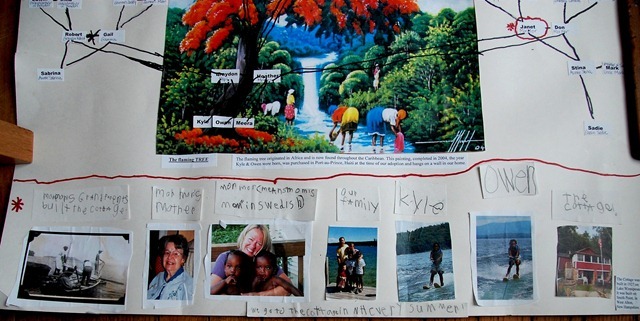 The bottom third depicted our ‘vignette’: a simple photo chronology of five generations of MorMor’s side of the family, including Kyle and Owen, with the tangible (and very real for K & O) focal point being “The Cottage” (where we spend time each summer). In the end, we were all very proud of this project. The boys were so excited to bring it to school. Their teacher was thrilled with it (and it apparently raised lots and lots of interesting conversations in their class! I can only imagine!). But probably I, more than anyone else, took great pride in the finished product. Mostly I just felt so relieved to have found a way to pull it off so that it honored and celebrated both the complexity and simplicity of adoption. I’d love to hear how other adoptive families have approached it, or plan to, when the time comes! 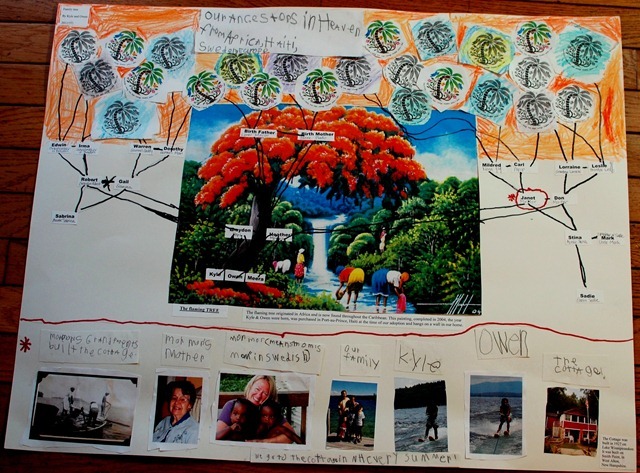 I’d also love to hear how non-adoptive families (and teachers) feel about non-traditional family trees like this one showing up in their kids’ classrooms! Happy National Adoption Month! 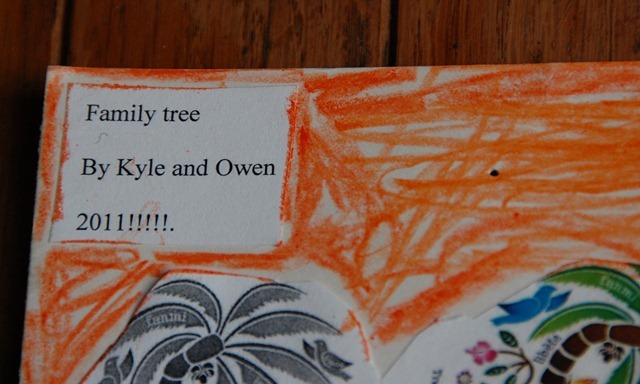 I’m really impressed with Kyle and Owen’s family tree and your group effort to complete it! It looks really amazing and you’ve all done a great job tying in the many aspects of Kyle and Owen’s heritage. I remember drawing a family tree with the help of my family when I was in 2nd grade, I can empathise with it being tough project. Thanks for sharing this, it’s a great model of how to honour both families involved in adoption and to do so in beautiful way that celebrates it. You guys!!! This was so lovely! Amazing job. Thanks so much for sharing. Beautiful family tree project!!! Love how you incorporated everything. I think it’s just perfect ! I was wondering if you were planning on adopting again from Haiti? As a teacher I’d be thrilled with an original, obviously true to the heart project like this one being turned in. I try to give assignments that have room for creativity and won’t result in 20+ identical projects or papers, but I’ve always been hesitant to assign a family tree project for the reasons mentioned in the post. I love how K & O’s project turned out, and I’m curious to hear other adoptive parents’ opinions on this type of assignment. That’s a beautiful project, you should be very proud of it. As far as those kind of family trees showing up in classrooms and such, and the reaction you would get from the teacher and the students and parents, I think it kinda depends where you’re living. For example, I’ve worked, volunteered, and interned, in many classroom and after-school settings in several urban areas around New Jersey, and I mean URBAN (i.e. Newark, Trenton, Plainfield, Asbury Park), so it’s nothing new for me or for most of my colleagues. I’ve dealt with adoptive families, combined families, traditional families, and yes, I’ve dealt with quite a few overgrown trees with many disjointed limbs and knots… LOL It’s sad but true, and I’m sure once I earn the title School Social Worker, it’ll get more intense. For my own end of it, when I have my own adopted children, I would probably aim to do something similar to what you did, but probably something more African. I don’t know where I’ll be living at that time, but I hope my kids classmates and their parents would be accepting of it too. Keep up the good work!!! God Bless!!! 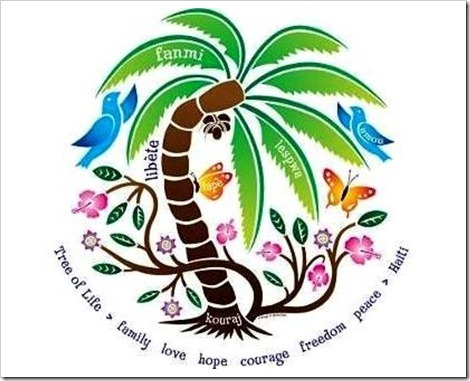 I think the Family Tree assignment is always a delicate one, whether there is adoption or not. But I also think it’s an interesting one, especially for kids who have questions about their past, so I don’t think it’s necessarily a bad one. Great job on it, and like other people I’d be curious about how other adoptive families address this. I’m hoping to be an adoptive mom in the future and I wondered how I’d go about this then if it came up. 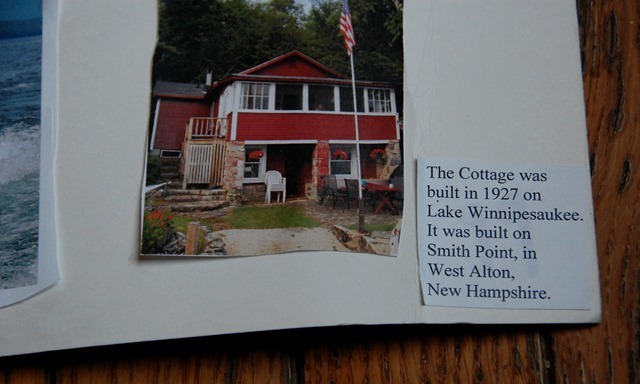 While we’re not yet adoptive parents (he’s coming in the next six months), I *am* from Lake Winnipesaukee so I’m thrilled to see the lake house where your sons learned to water ski!